Hyderabad: On an average, at least three years of one’s life is spent in bathroom. This has forced people to rethink about design aspects. Over the years, bathrooms have evolved as the pivotal point of design, said interior architect and water conservationist Kalpana Ramesh at a knowledge sharing seminar on ‘Changing Face of Bathrooms’ here on Sunday. 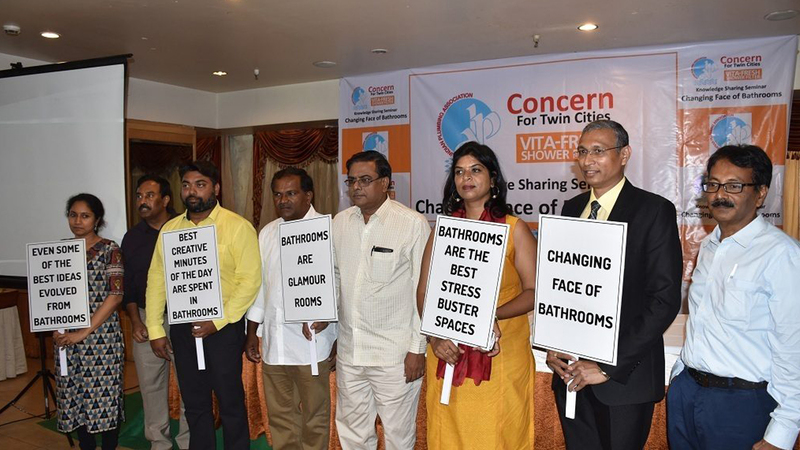 Aimed at sharing latest developments and trends in bathrooms, the Hyderabad chapter of Indian Plumbing Association collaborated with Vita Fresh and Concern for Twin Cities on Sunday to organise the event. “Bathrooms have today acquired prominence while designing the interiors of a house as stress buster spaces where one could ease out, relax, refresh and get some of the greatest startup ideas. Innovatively managing the spaces and usage of water, embracing technology is the need of the hour,” Kalpana said. According to the speakers, a study that was conducted recently revealed that we visit toilets 2,500 times in a year and spend three years on the toilet in our lifetime. House owners end up spending more on bathrooms than their drawing rooms, the participants in the seminar said. On a lighter note, the members of Indian Plumbing Association said that bathroom was the reason for frequent arguments for 70 per cent of the couples. Interestingly, close to seven million people drop their mobile phones in their bathrooms, Director of Supra Builders, Chaitanya Rayapudi, said. “These days the clients are focusing more on better options for the dry and wet areas of the bathrooms,” he added.